Way back in the dark ages of this blog (jeez, have we really been doing this for six years?) I read Kress’s first book, Alex and the Ironic Gentleman, and absolutely loved it, so a Kress book about girls teaming up and becoming friends in steampunk Victorian England seemed like a sure thing for me. But, well…maybe I’ve become more discerning (or more jaded) in the intervening years (six of them! good god); maybe I unthinkingly give more of a pass to first-time authors and expect more after a few (six) years have gone by; maybe Alex was just way better. 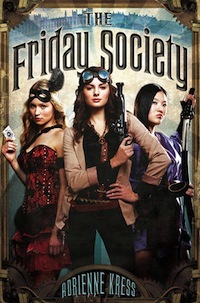 Because I’m sorry to say, I really didn’t enjoy The Friday Society very much at all. The first issue I noticed was the Victorian setting. By which I mean: it was nonexistent. Yes, technically it took place in turn-of-the-century London, but the prose was completely modern, and the heroines speak with current colloquialisms (“I look hot,” “This is totally uncool,” etc.). Though there are some 11th-hour throwaway remarks about feminism and the restrictiveness of Victorian society, the girls are fairly unrestrained by their time period; they go where they want when they want, they talk back to and hit on men, they have a slumber party. (This book contains both a typical modern dinner date and the words “make out session.” Nope nope nope.) The steampunk is barely a factor until the very end, when they bust out a couple of cool weapons. There was no sense of mood, of place, of worldbuilding. A huge part of the enjoyment of steampunk comes from reveling in the 19th century setting and clockwork inventions, so when a book doesn’t bother, it smacks of bandwagon-jumping. Certainly it begs the question: If you’re not going to use your historical setting, what’s the point of having it? The other major character of color is Raheem, Nellie’s boss, a mysterious and wise magician whose face and bare body are described with more sensual detail than any other character in the book, who gets mysterious shipments from Africa, and who is a font of tea, yoga, and Eastern mysticism-tinged wisdom. Oh, and there’s a Chinese man who works in an opium den and seems to be part of the conspiracy in a way that never actually pans out. I will give Kress this credit: she attempts to problematize the racism and Orientalizing of Victorian culture. Michiko’s employer treats her like a thing to put on display and is deeply ignorant of Japanese culture, and the book heaps scorn on him for it. Nellie is dismissive of people who exoticize or fear Raheem. But Kress’s noble efforts to problematize this exotic othering fall flat in the face of her silent, sexless samurai heroine, victimized by white men and uttering only a few halting English sentences; or her sexually objectified, mysteriously wise, magic-wielding brown man. Especially when the bit characters of color consist of a wise samurai and an opium den owner. I mean, come on. You can’t combat racism by deploying a dozen unconfronted stereotypes! I liked the concept of the book a lot, and the efforts to build a friendship between girls and confront ideas of sexism, classism, racism, and sexual violence. Those are all good things! But ultimately the lack of Victoriana research or worldbuilding, problematic handling of race, and thin characters and prose left The Friday Society very lacking. Two and a half cupcakes. This entry was posted on Wednesday, February 6th, 2013 at 4:45 pm and is filed under 2.5 Cupcakes, Historical Fantasy/Steampunk. You can follow any responses to this entry through the RSS 2.0 feed. You can leave a response, or trackback from your own site.